This is the most astonishing dish that I have eaten this week, this month, this year. What looks like a porcupine splayed on a plate is a spiny sea urchin shell. The cavity in the center holds seafood risotto, a soft, chewy mixture crowned with a luxurious dollop of pure fresh sea urchin. 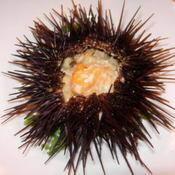 Antonio Mure, chef/owner of Il Carpaccio in Pacific Palisades, came up with the idea for a dinner that showed off sea urchin (uni) brought to the restaurant straight from the fisheries off San Diego. There was sea urchin sauce over carpaccio of seabass cut as fine as tissue paper. There was sea urchin on garlic crostini in the center of thick fennel soup. There was sea urchin dressing on involtini di pesce spada (rolled sword fish) on a bed of caramelized shallots. No sea urchin in the dessert, lemon tart with fresh berry puree. But there was more to come--little glasses of limoncello and sea urchin on the front counter, a sweet and briny shooter to down on the way out. Il Carpaccio, 538 Palisades Drive, Pacific Palisades, CA 90272. Tel: (310) 573-1411. Open for dinner only, 5 p.m. to 10 p.m. Sunday through Thursday; 5 p.m. to 10:30 p.m. Friday and Saturday. Here’s the perfect party dish. You put it together the day before, bake it an hour before the guests arrive, then show off gorgeous, glistening, exotic chicken. All you have to do is put chicken pieces to soak in soy sauce, garlic, ginger, wine and a dash of oil. Not just any soy sauce. It has to be Indonesian kecap (pronounced ketjap). Thick, dark and sweet, with a hint of molasses, kecap imparts mellow flavor and beautiful deep color. It’s available in most large Asian groceries. In Indonesia, this chicken would be barbecued. A friend who lived in central Java adapted it to western ovens and gave me the recipe. 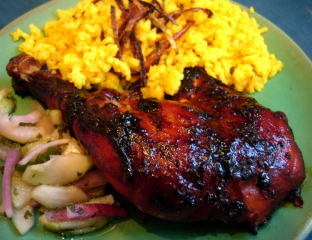 The photo shows it with Indonesian yellow rice and a cucumber relish. Trim excess fat and skin from the chicken. Place the chicken in a refrigerator container with a tight-fitting lid. Mix the kecap, garlic, ginger, wine and oil in a small bowl. Pour it over the chicken and turn to coat well. Cover and refrigerate overnight. If the lid fits tightly, invert the container occasionally to coat all sides of the chicken. Or remove the lid and turn the pieces. Place the container at room temperature for 1 hour before cooking. Preheat the oven to 350 degrees. Spray a 13x9-inch baking pan with non-stick cooking spray. Or line with foil and spray the foil. Place the chicken skin side up in the pan. Pour any marinade in the storage container over the chicken. Bake 1 hour. Baste two or three times during the last 30 minutes. Remove the chicken from the pan and let stand briefly before serving. If using halved or quartered chicken, cut it into serving-sized pieces. Dark and woodsy, with huge plate glass windows and vintage movies streaming across the back wall, Qusqo looks like a neighborhood coffee shop for artsy Westsiders. When you consider that it celebrates happy hour, offers sandwiches for lunch and presents itself as a “bistro & gallery, ” you are all the more certain that it is just another gathering spot for the young and trendy. It is, indeed, all of these things. But it is something more that is not apparent from a quick glance passing by. Quzqo is a full-fledged Peruvian restaurant. The name is a quirky spelling of Cusco, th e jumping off point for Machu Picchu. Perhaps it’s a bid for attention, switching restaurant names around so that they spell the sams thing in a different way, like Wahaca (Oaxaca) in London and Wakatay (Huacatay), a Peruvian-Japanese restaurant in Gardena. Qusqo has some very good dishes, others that miss the mark. 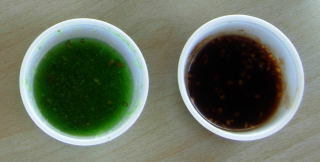 Such failings often occur at restaurants outside Peru, because ingredients are not the same or are not available. 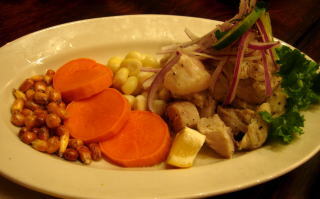 Qusqo's ceviche is one example. It’s well presented and includes the right garnishes—steamed giant corn kernels, crisp golden corn, red onion strands and sliced sweet potato. But the firm, chewy cubes of halibut used the night I was there were wrong for this dish. Lima’s seafood is glorious. It’s hard to match that standard here, but more tender fish would have been better. On the other hand, chupe de camaron (shrimp chowder) was delicious, packed with large, juicy shrimp in a pleasant broth, better than the last version I had in Lima. Aji de gallina, shredded chicken in a subtle, smooth walnut sauce is worth ordering. So is giant corn on the cob in cheese sauce, even though the only such corn available here is frozen. 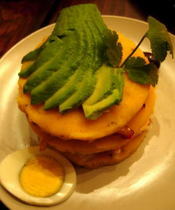 American potatoes are different in moisture content and texture from Peruvian potatoes, and this creates a problem for causa, a stacked cake that layers golden moist potato puree with seafood or chicken filling and avocado. At Quzqo, thin potato cakes replace the soft puree. But the real problem was the canned tuna filling in my serving, a harsh and alien flavor for causa. The meat for lomo saltado (stir-fried beef), listed under chifa (Chinese style dishes), was tough, but I’m not so sure I wouldn’t find it that way in Peru. The soggy French fries in this dish are not a mistake. Peruvians mix them with the meat instead of serving them on the side. 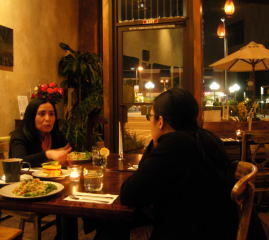 Qusqo’s owner is Lucy Haro, a young, American-born Peruvian, who bases her dishes on family recipes. Her alfajores (dulce de leche sandwich cookies) are exceptional. I’ve eaten many alfajores in Peru and Argentina, but never any like Haro’s tender, buttery cookies. They’re sandwiched with delicate dulce de leche made at the restaurant, not the heavily sweetened commercial product. A single cookie comes in a bowl of ice cream with an orchid and a wooden spoon. Qusqo has enough good dishes to make eating there worthwhile now. With a little more work, it could become one of the better Peruvian restaurants in Los Angeles. 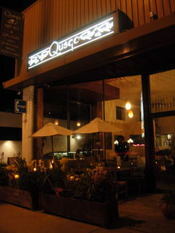 Qusqo, 11633 Santa Monca Blvd., Los Angeles, CA 90025. Tel: (310) 312-3800. Lunch 11 a.m. to 3 p.m. Monday through Friday, Dinner, 5:30 to 9 p.m. Monday, to 10 p.m., Tuesday through Thursday, to 10:30 p.m. Friday and Saturday. Closed Sunday. San Antonio Winery Maddalena Sauvignon Blanc 2006. This is the perfect wine to welcome spring. It’s fresh, crisp and as light as a spring day, with just enough grassy-citrus flavor to make it interesting. The sun glinting through a glass of this pale wine is a beautiful sight, so serve it in the late afternoon on the patio, with cheeses. I poured it with a spicy pork milanesa and another time with creamed chicken and noodles. In other words, it’s good with just about anything. The suggested retail price is $11.95. We were planning a trip to Oaxaca, and I promised I’d let you know about restaurants we especially liked. The favorite was Casa Oaxaca. We ate there twice so I could re-experience camarones al guajillo con alcaparras, setas, flores de calabaza y ajo (prawns with guajillo chiles, capers, oyster mushrooms, zucchini flowers and garlic). The dish was served on a pureed plantain base—delicious. 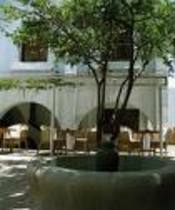 Casa Oaxaca is located at Garcia Vigil 407, Oaxaca, Oax., Mexico. Tel: 52 (01) 951-514-4173. If you drank a different tequila every night for a year, you still wouldn’t get through the stash at Amaranta Cocina Mexicana in Canoga Park. This restaurant prides itself on making available more than 375 tequilas. Some are displayed in niches in the wall at the back. All of them are on a very long menu divided according to color and intensity of flavor. The list starts with “The Best of the Best,” meaning ultra premium tequilas . The “best” of these is Partida Elegante Extra Anejo, at $110 a shot. You don’t get just tequila for that, but a fancy presentation on a silver tray garnished with cinnamon-dusted orange slices and your choice of any entrée. The most expensive dish is filete minon con cabra (filet mignon with bacon, tomatillo and chipotle sauce and an ancho chile stuffed with goat cheese). At $19, it would bring the cost of the tequila shot down to only $91. 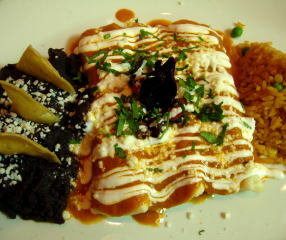 If I were choosing, I would go for the enchiladas de jamaica ($16). My Partida shot then would rise to $94. This is only the second time that I have seen red jama ica (hibiscus) flowers used at a restaurant in anything but a drink. The other occasion was in Oaxaca at El Naranjo, where fresh jamaica flowers were mixed into a salad. If I ordered my second choice, coliflor capeada (fried, batter coated cauliflower), the shot would go up to $98, because this dish is just $12. 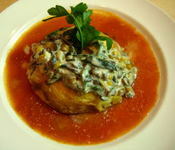 The cauliflower is stuffed with cheese, set in a tomato sauce and topped with a creamy mixture of poblano chile strips and mushrooms. It’s another dish not often found on restaurant menus. The enchiladas, by the way, contain vegetables as well as jamaica flowers, which add a nice tang to the flavor. More flowers are on top, along with strands of sour cream. If there were anything left in my wallet or credit card account after the tequila splurge, I would then order Mexican chocolate brownies ($6). These are lightly sweet and cake-like rather than dense and fudgy. And they taste delicately of the spices used in Mexican chocolate. 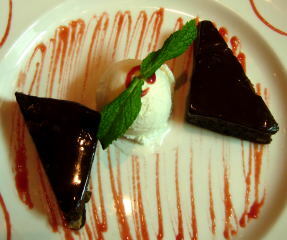 Cut into triangles and glazed with chocolate sauce, the brownies come on a big plate with a scoop of vanilla bean ice cream and swirls of strawberry coulis. If I were too broke to afford this presentation, there is another option. Mexican chocolate brownies to go are only $2 in the takeout shop next door. 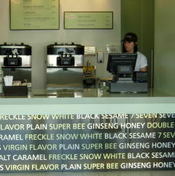 Sleek, stylish, cool, green--these are words that come to mind when I think of Tutto Tutti, a new Korean-owned frozen yogurt place on Melrose Avenue in Los Angeles. It adds so much class to an undistinguished mall at the corner of Melrose and Mansfield Avenues that it almost seems out of place. The owners, husband and wife team Seung and Soo Kim, worked for months to perfect yogurts as elegant and subtle as their shop. Soo, a chef, has an Italian Korean restaurant in Seoul. She became enchanted with gelato while in culi nary school in Italy. The initial flavors--the shop opened in January--aren’t so much Italian as Korean. 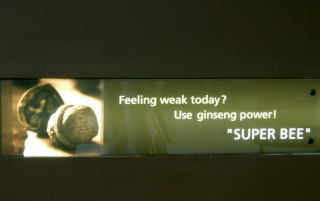 Super Bee blends honey with finely ground pure Korean ginseng root. Freckle Snow White isn’t freckled at all, although made with black sesame seeds. It’s so delicately colored that you have to look closely to distinguish it from other flavors. Double Wonder (sea salt and caramel) is just as subtle. The base for all of them is organic fat-free yogurt, as verified by a tub of empty Horizon yogurt containers at the door. The creamiest flavors are White Velvet (vanilla), Seven Grains and T, which combines Ceylon tea, fat-free milk and honey. New flavors contemplated for summer include mimosa, sangria and perhaps one that combines ginger and mint. The toppings are as fresh and healthy as the yogurts—a puree of blackberries and strawberries; balsamic marinated fruit, fresh blueberries, strawberries and balsamic raspberry puree. The closest the shop gets to candy toppings is caramelized walnuts. Tutto Tutti opens at 7 a.m. The ideal yogurt to have at that hour would be Seven Grains, because it offers a jolt of protein and fiber. The grains include black beans, black rice, black sesame, oatmeal and wheat, with a bonus dash of seaweed. The real reason for opening so early is coffee, based on espresso made with organic beans. 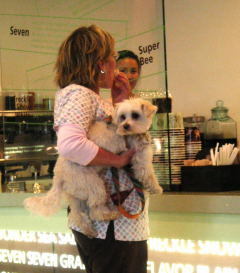 There’s iced coffee too, produced by an elaborate glass contraption that swirls about like high fashion lab equipment. In 10 to 15 hours it transforms cold water into coffee that is acid free and low in caffeine, yet richly flavored--healthy coffee to drink with healthy yogurt. Flavored yogurts are $4.50; Virgin (plain) yogurt is $4; toppings are $1 to $2, depending upon the number of layers desired. 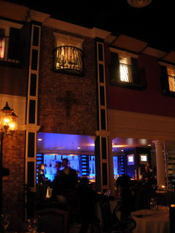 Tutto Tutti is located at 6803 Melrose Ave., Los Angeles, CA 90038. Tel: (323) 939-9424. Open daily from 7 a.m. to 10:30 p.m. Whenever I’m in West Los Angeles, I try to get to the Samosa House for lunch. The food set out each day is irresistible. It’s always different, always interesting. And all of it is vegetarian . In a corner at the back of this large and well-stocked Indian market (when I first went there, it was called the Bharat Bazaar) is a hot foods counter and a case of sweets and snacks. People come in for food to go or to eat at tables scattered through the market and outside. 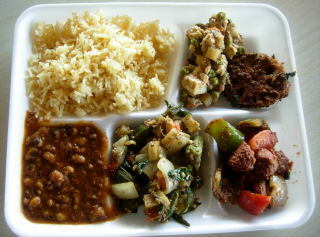 A combination plate is just $6.99 and includes a choice of any three main dishes, rice, raita and freshly made chapatis. The other day, I couldn’t stop at three dishes because there were so many tempting things to try, like a vegetable combination (peas, carrots, tomatoes and potatoes) mixed with paneer (Indian cheese), cashews and here and there a raisin for a surprising burst of sweetness. What looked like a meaty Chinese stir-fry with bell peppers, ginger and onion simulated meat with soy nuggets. Chinese food is immensely popular in India, so it wasn't unusual to find it at the Samosa House. 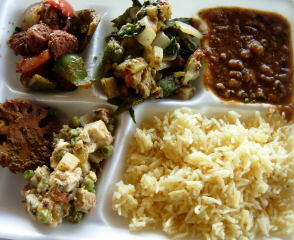 A crunchy slice of lotus root embedded with seasonings was delicious, and I fcouldn't pass up spicy lobhia (black eyed peas), okra cooked with onions, potato, tomatoes and ginger and soft, yellow cake-like dhokla, all of this accompanied by cilantro and tamarind chutneys and chapatis. Drinks, which are extra, include sweet and salty lassis, mango lassi and chai. When you are finished, it’s time to shop, for anything from Indian tea, basmati rice, garam masala and fresh curry leaves to recipe books, incense and beguiling figures of Indian gods to watch over you as you cook. 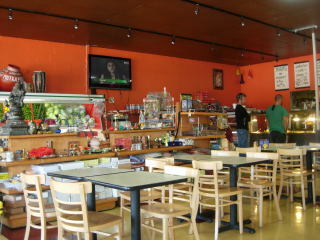 The Samosa House is located at 11510 W. Washington Blvd., Los Angeles, CA 90066. Tel: (310) 398-6766. Open daily from 11 a.m. to 9 p.m.
My fig tree is sprouting its first touch of green, but I’ve been eating figs all year—dried fig sweets from Surati Farsan Mart in Artesia’s Little India. This shop specializes in Gujarati sweets and snacks. Among them is kaju anjir barfi, a delicious cashew and fig confection that would be at home in a health foods store. It satisfies that compelling urge for candy with natural goodness instead of a sugar high. 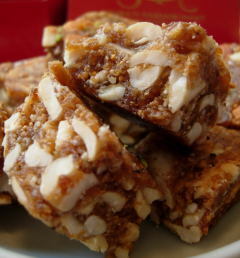 The shop has other fig sweets too, among them sugar-free dry fruit barfi made with pistachios and raisins as well as cashews and figs. Apart from these, the counter is loaded with intensely sugary traditional Indian sweets, some of them in fanciful shapes and colors; salty snacks, and wonderful cardamom-flavored plain cookies. 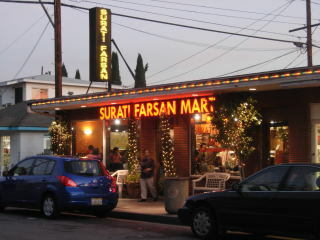 Surati Farsan Mart serves meals and drinks too. Daily specials, all vegetarian, include vegetable curries, chole puri (spiced garbanzo beans with a puffy whole wheat bread), samosas, pav vada (potato patties and garlic chutney in a bun), vegetable sandwiches with cilantro chutney and south Indian snacks such as idlis and dosas. 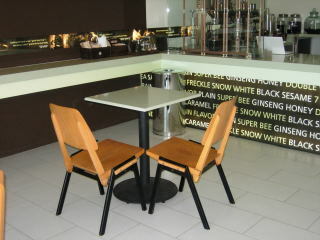 The shop provides tables for customers who want to eat there. It’s usually crowded on weekends, because that is prime shopping time for the Indian community. I usually drop in loaded with sacks of groceries and retaining just enough carrying power for a box of fig sweets, and perhaps some of those cardamom cookies too. Kaju Anjir Barfi (cashew and fig sweet) is $7 a pound; sugar-free dry fruit barfi is $9 a pound at Surati Farsan Mart, 11814 E. 186th Street, Artesia, CA 90701. Tel: (562) 860- 2310. Open Tuesday through Sunday from 11 a.m. to 8:30 p.m.
A San Diego branch is located at 9494 Black Mountain Road, San Diego CA 92126. Tel: (858) 549-7280. It’s hard to figure out just where I am. Is it a village in France or a karaoke bar? 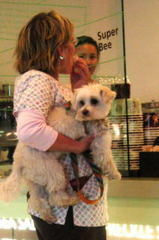 Actually it’s both, because I am in La Defence, a new Euro-Asian restaurant on Wilshire Boulevard in Koreatown. The dining room is an imaginary village plaza. 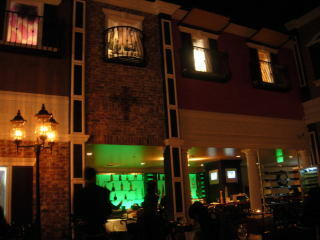 The large room is lined with fake buildings and windows behind which are the karaoke rooms. Fortunately, the twain don’t meet. No off-key singing assaults your ears as you eat. Instead, you can gaze through the front windows at dramatic splashing fountains. La Defence hides at the back of a large business complex built around a spacious courtyard. The restaurant caters to a business-entertainment crowd, and so the karaoke rooms double as conference rooms. . The chef is Los Angeles-born Yuji Iwasa who has cooked at such restaurants as Koi and L’Orangerie. Iwasa likes to create personalized tasting dinners, bringing together flavors that sometimes startle, as in an espresso-chocolate sauce for lamb chops. I thought the combination worked, but it bothered some of my friends. We were eating our way through a 10-dish menu that gave us a chance to taste both Kobe beef from Japan (wrapped around jumbo asparagus) and American raised Kobe beef (a flat iron steak with jalapeno beurre fondu). I can’t say that one was better than the other, because they were prepared in such different ways. Seafood dishes were very good, among them ahi tuna tartare “yu-ke” style, meaning seasoned like Korean raw beef with such things as soy sauce, sesame oil, green onions and pine nuts. There were interesting tournedos fashioned from sea scallops and beef, delicious miso-bronzed black cod, and crab cakes modeled on Japanese croquettes, soft and creamy inside, crisp with panko outside and sauced with a grapefruit emulsion. The one dish that needed rethinking was seared foie gras “pina colada.” The foie gras was wonderful, silky and light. But artificial coconut flavoring overpowered the scoop of sherbet alongside. After all this, it was hard to appreciate dessert, a busy platter of chocolate bread pudding with white chocolate-orange sauce, chocolate sorbet, raspberries and little dollops of whipped cream. I’d like to go back to try the daily “plats du jour,” which include coq au vin with ginger-red wine sauce on Monday, steamed mussels in coconut curry broth on Tuesday, and grilled kurobuta pork chops with gorgonzola miso apple sauce on Thursday. Miso risotto sounds interesting, and I can't imagine what toasted Caesar salad would be. La Defence is new and still getting settled, but worth a visit just to experience the unusual setting—to me, it felt like being on vacation somewhere—as well as Iwasa’s innovative food. La Defence Restaurant and Karaoke, 3701 Wilshire Blvd., Los Angeles, CA 90010. Tel: (213) 384-9500. As of May, 2008, the above review is history. The promising menu and chef are gone and the food at La Defence is no longer recommendable, according to my informant.